When I started with the layout of my grass feature, I knew that I would have a few gaps where I could add some low ground cover. So off I went (again!) to the nursery and assembled a few new grasses to add to my collection. I wanted to share these with you, seeing I took some photo’s of them this week. I also found out that these grasses actually came from Fairholme Nursery. So I was very pleased to see that Builders Warehouse’s Nursery at Sunningdale had a lovely range of grasses. Armeria Maritima - “White Thrift” – Thrift or sea pink is a compact, low-growing plant which forms a dense, mounded tuft of stiff, linear, grass-like, dark green leaves (to 4″ tall). Tufts will spread slowly to 8-12″ wide. Tiny, pink to white flowers bloom in mid spring in globular clusters (3/4-1″ wide) atop slender, naked stalks rising well above the foliage to 6-10″ tall. Sporadic additional flowering may occur throughout the summer. Flower clusters are subtended by purplish, papery bracts. In the wild, thrift or sea pink commonly grows in saline environments along coastal areas where few other plants can grow well, hence the common name. 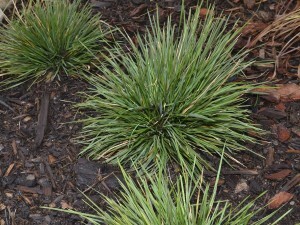 Carex ” Frosty Curls” - Carex albula ‘Frosty Curls’ is an evergreen perennial grass that has a dense clumping growth habit. 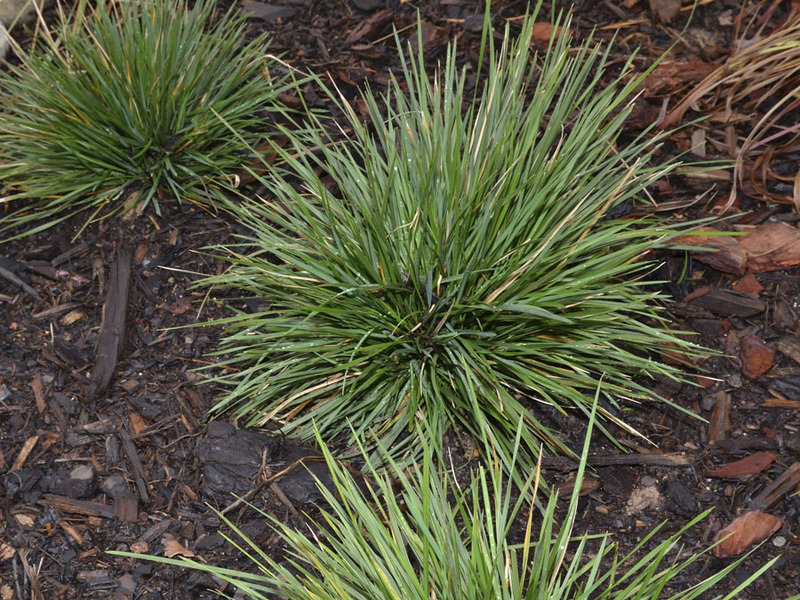 The foliage is a silvery color and as the ends die back the blades will curls hence the name Frosty Curls Sedge. 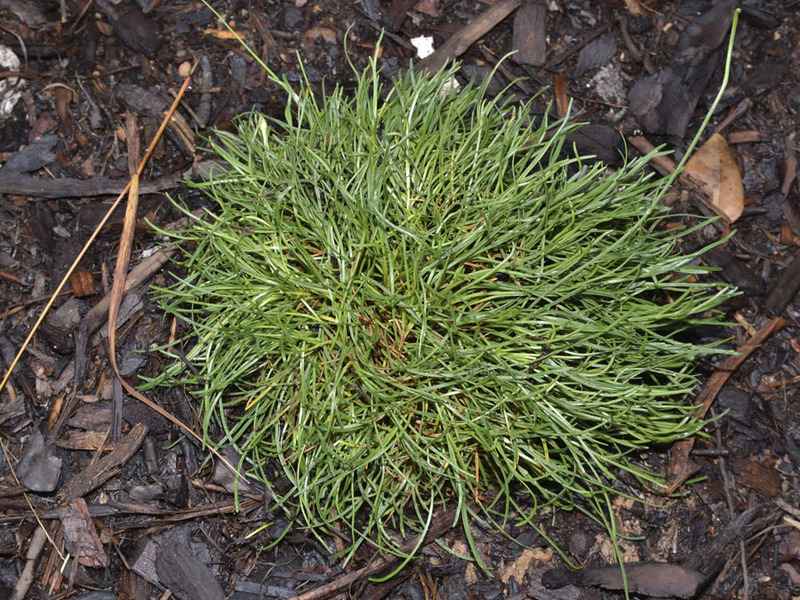 This grass does best in partial shade to shady conditions and can get 12″ tall with a 2′ spread. 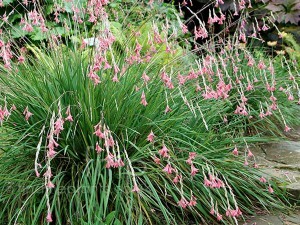 When planted on a hillside or when allowed to spill over a wall Frosty Curls Sedge gives the illusion of flowing water. 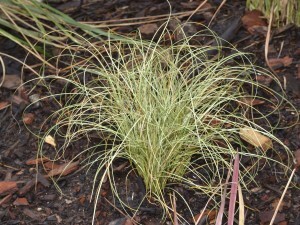 Frosty Curls Sedge is an excellent choice for mixed containers as well, giving them movement. Does best in a moist well-drained soil. 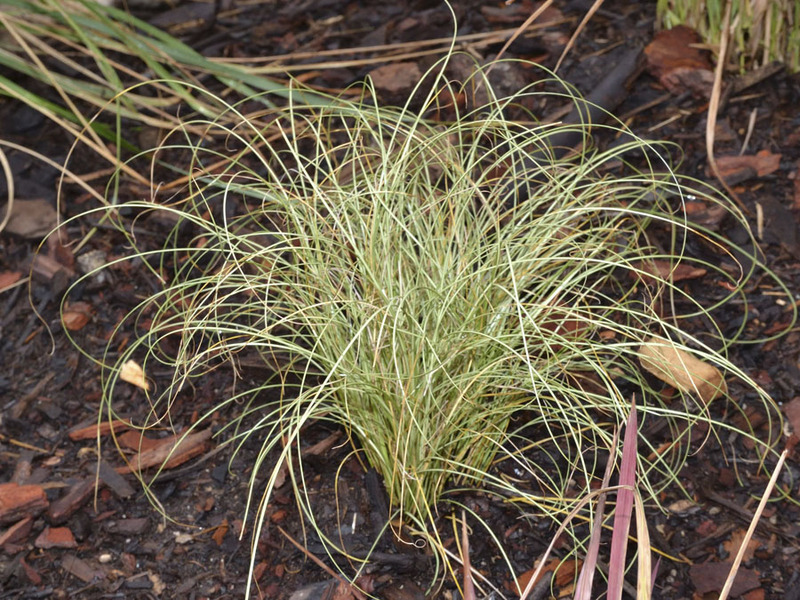 Deschampsia Caespitosa - ” Tufted Hair Grass” – The feathery flower spikes can be green, silvery, golden, purple or variegated with these colours. Tufted hair-grass arches gracefully; this is a delicately beautiful grass of damp grassland and marshes. 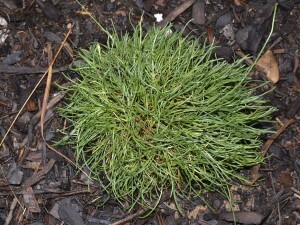 It has a tendency to be invasive and its coarse tussocky habit threatens to form a monoculture unless it is controlled. Hmmm, I did not do my homework before I planted this grass, so I best watch it carefully. Dierama Latifolius - “Angels Fishing Rods” – This is not a grass but I liked it. D. latifolium is an evergreen perennial with grass-like leaves and in summer, it bears pendant pink or red, bell-shaped flowers, on slender, arching stems that move in the slightest breeze. Another name for it is wand flower. I love these – especially the Dierama Latifolius. Very pretty. I also read somewhere that the Deschampsia is poisonous. Oh no! I better double check on this. Does anyone know if this is true? Dierama is South African. Jack at Sequoia Gardens has a few posts up. It is more from his part of our country. Pretty plant, that I have somehow never tried. Perhaps I should tuck it in the creek, where its roots will stay moist? Hi Diana, I went to Jack’s post and indeed, he has some beautiful images of them. It was an impulse buy and I liked the leaves (no flowers as yet) so It will be a surprise to see what the flowers look like. I’ll keep it well watered! Aren’t Jacks’s photos fantastic? His gardens are simply sublime! Absolutely amazing. Great photographic talent and the flowering plants an inspiration. Christine, Barbara, have you a new set up regarding your postings now? Grasses when placed well do add to the over all appearance of the garden, we often get this wrong and chop and change continually. Also I am not particular enough about naming them, you have prompted me to pay more attention to this. The Dierama is a great plant, there is a very tall one, Dierama pulcherrimum (Angels fishing rod) I have seen it in flower (fantastic) although it really prefers Summer temperature a little higher than we get in Aberdeen. Hi Alistair – good to hear from you! I am new to the grasses myself and wanted to have a waterwise section in my front garden. I am also keen to see the lowers of the Dierama. I saw on one site I googled that is is classified a rare plant. Is this so? I think you’ll be surprised how large/wide the grasses get — at least some of them — next year or the year after. You’ll be wondering where the “gaps” went I think. My favorite type of planting. Hmmm… thanks for your advice here. I have a feeling I’ll need to keep an eye on it. I like a ‘naturally grown’ garden, you know what I mean…..the gaps I don’t need. 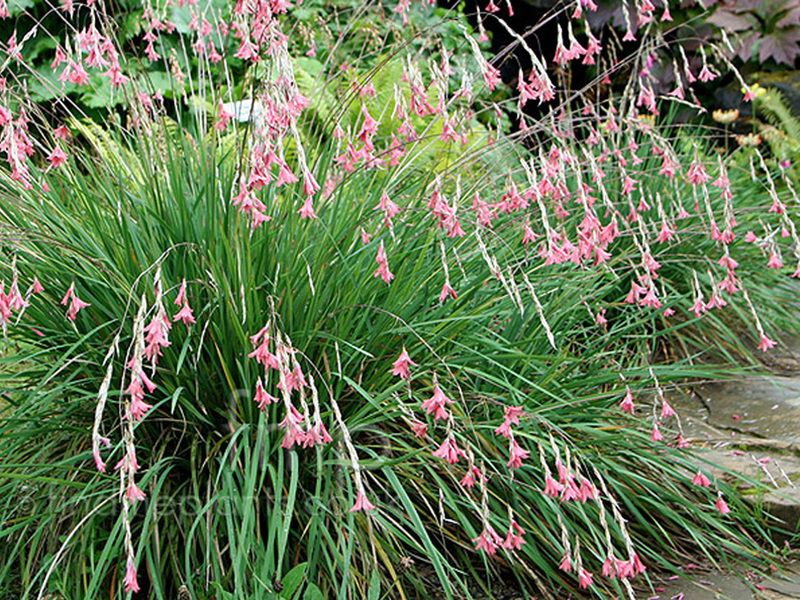 Barbara – I also love grasses and reckon they are one of the most under rated plants in a garden. To watch them dance and sway in the gentlest of breezes – too beautiful for words and completely mesmerising. Hello Dani, you are spot on!! I also did not know that they also flower and have colour, so this will be a kodak moment to capture ! I find ornamental grasses lovely. There is such a great variety and I am trying to incorporate more of them in my garden too! I do like the wispiness of Carex frosty curls. Carex frosty curls are so fun and wispy! I really think evey garden can do with one! I am keen on waterwise gardens but I am not fond of the aloe family, so the grasses are a perfect choice! There are so many varieties!